How hard is it to try and find the ideal Christmas present? With more and more people doing there shopping online, taking advantage of Black Friday and Cyber Monday promotions, cyber-crime is becoming increasingly more common. I have teamed together with Kaspersky to offer one lucky reader the chance to win multi-device protection this Christmas. 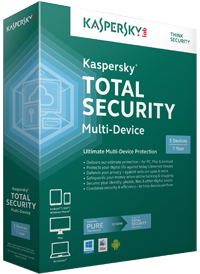 If you would like the chance to win the Kaspersky Total Security for multiple devices please enter the rafflecopter form below. Happy shopping :). I'm an eBay girl...who doesn't love a bargain??? Amazon as I have an Amazon Prime subscription so I get everything really quickly. Amazon, especially with my prime next day delivery! It's Amazon. that does ashame me, as they don't pay their tax, meaning they're like Starbucks (haven't walked in SB for two years at least) and to be avoided, but they're also like Aldi (where I shop) and have everything I need, just about, at a price I can afford! Tesco direct, got to save those club card points! Mine is Amazon as there is so much to choose from, thanks for the lovely giveaway. I like to use http://www.imutual.co.uk/ It's different from other sites as you can earn shares. Amazon, we do not have a car so it is a great way of saving time. Whenever I need something it's straight to eBay! Firebox! I love the random crap they have on there. Amazon, I am always on buying something needed!! Amazon and eBay. Anything and everything you could want!! !